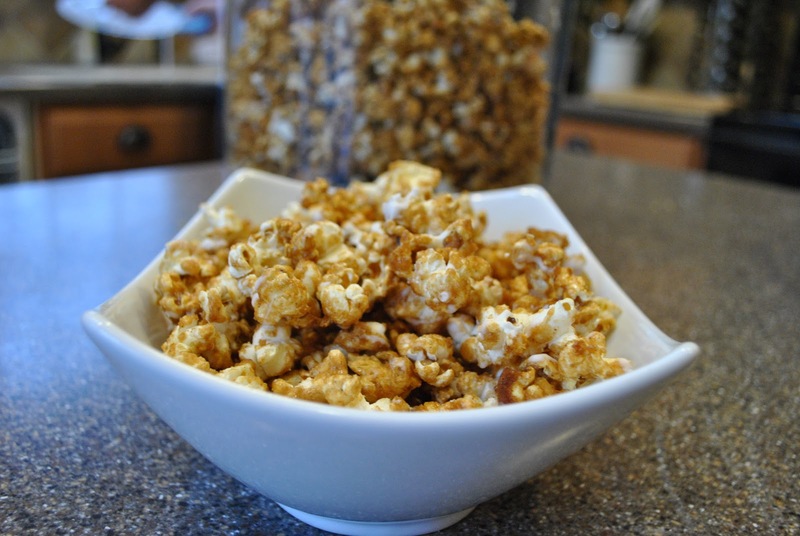 Want some gourmet popcorn that you can make right at home? It's easier than you might think. But it probably involves more butter than you think so make this before your New Year's resolutions take effect. This would actually be a perfect snack for a New Year's Eve party. However, if you make your popcorn in the microwave, I hope you'll reconsider. It is so much better when you make it on the stove top. You don't end up with all the chemicals and it's super easy. All you need is a large sauce pan with a tight fitting lid, a little canola or vegetable oil, and some popcorn kernels. Personally I've replaced my popcorn pan with a Whirleypop, a switch I made a few years ago when we upgraded our stove to a glass top instead of coil burners. I didn't want to scratch the stove top shaking the pan so I bought the Whirleypop which has the same result but since it has a mechanism to stir the popcorn inside the pan, you don't have to shake it. It was a worthwhile investment for us since I'm a popcorn lover and it was only about $30. Anyway, back to the recipe, you can make your popcorn on the stove or in an air popper, or if you must use the microwave, at least make sure you are using the natural popcorn without butter or other flavorings. Preheat oven to 250 degrees. Line two large baking sheets with parchment paper. Pop popcorn and set aside in large bowls, make sure to leave yourself room to mix in the bowls or it will get very messy. Combine brown sugar, cinnamon, butter, and corn syrup in a large microwave safe bowl. (If your butter is straight out of the refrigerator, cut it into chunks before adding it to the bowl to help it melt faster.) Microwave on high for about 30 seconds and then stir to combine everything. Microwave an additional two minutes and stir and return to microwave for two more minutes. Add vanilla and baking soda and stir to combine, the mixture will foam and rise when you add the baking soda. Divide hot caramel mixture evenly among the popcorn bowls and quickly stir to coat the popcorn. Continue to gently mix until topping is well distributed. Pour popcorn mixture onto prepared pans and bake for approximately 30 minutes, stirring every ten minutes. Lay out another large sheet of parchment paper on your counter. Remove the popcorn from the oven and spread out on parchment paper. Melt almond bark (I like to use a double boiler method as it scorches very easily in the microwave but you can use whatever method you prefer) and drizzle over popcorn. 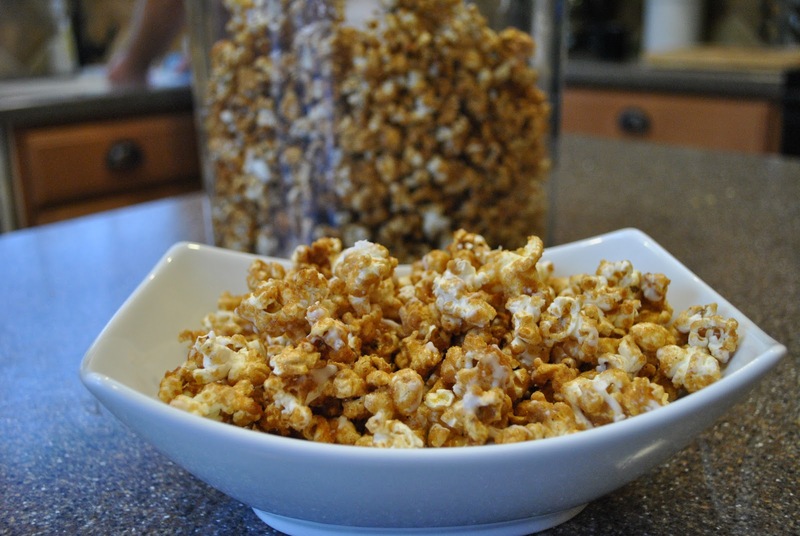 Let popcorn cool and then break into chunks and serve or store in an airtight container.